Sevier County as it is known today was formed on September 18, 1794 from part of neighboring Jefferson County, and has retained its original boundaries ever since. The county takes its name from John Sevier, governor of the failed state of Franklin and first governor of Tennessee, who played a prominent role during the tumultuous early years of settlement in the region. Since its establishment in 1795, the county seat has been situated at Sevierville (also named for Sevier), the eighth-oldest city in Tennessee. Prior to the late 1930s, Sevier County's population, economy, and society— which relied primarily on subsistence agriculture— held little significance vis-à-vis any other county in the rural South. However, with the creation of the Great Smoky Mountains National Park in the early 1930s, the destiny of Sevier County, within the bounds of which lies thirty percent of the total area of the national park, changed drastically. Today, rampant tourism supports the county's burgeoning economy which does not appear to be slowing any time in the near future. The State of Franklin was an unrecognized and autonomous territory located in what is today eastern Tennessee, United States. Franklin was created in 1784 from part of the territory west of the Appalachian Mountains that had been offered by North Carolina as a cession to Congress to help pay off debts related to the American War for Independence. It was founded with the intent of becoming the fourteenth state of the new United States. Franklin's first capital was Jonesborough. After the summer of 1785, the government of Franklin (which was by then based in Greeneville), ruled as a "parallel government" running alongside (but not harmoniously with) a re-established North Carolina bureaucracy. Franklin was never admitted into the union. The extra-legal state existed for only about four and a half years, ostensibly as a republic, after which North Carolina re-assumed full control of the area. Prior to the arrival of white settlers in present-day Sevier County in the mid-18th century, the area had been inhabited for as many as 20,000 years by nomadic and semi-nomadic Native Americans. In the mid-16th century, Spanish expeditions led by Hernando de Soto (1540) and Juan Pardo (1567) passed through what is now Sevier County, reporting that the region was part of the domain of Chiaha, a minor Muskogean chiefdom centered around a village located on a now-submerged island just upstream from modern Douglas Dam. By the late 17th-century, however, the Cherokee— whose ancestors were living in the mountains at the time of the Spaniards' visit— had become the dominant tribe in the region. Although they used the region primarily as hunting grounds, the Chicakamauga faction of the Cherokee vehemently fought white settlement in their territory, frequently leading raids on households, even through the signing of various peace treaties, alternating short periods of peace with violent hostility, until forcibly marched from their territory by the U.S. government on the "Trail of Tears". 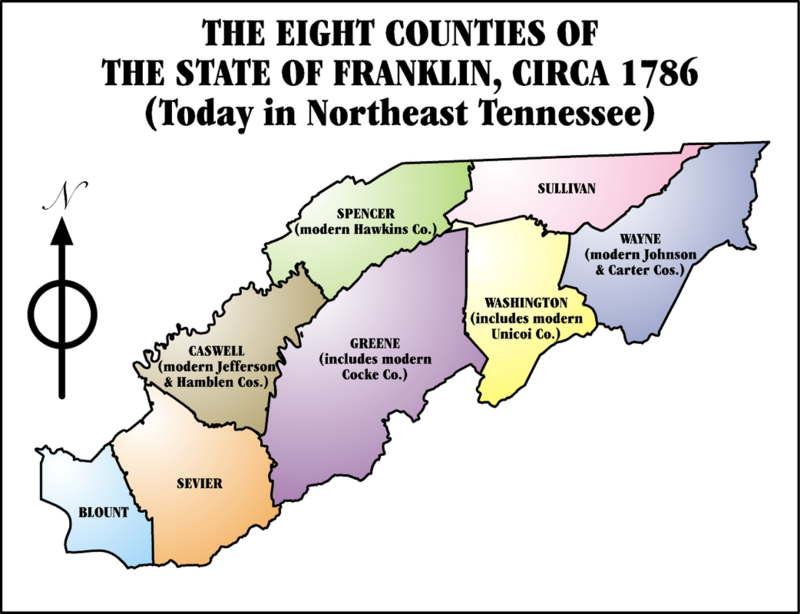 Sevier County was formed on September 18, 1794 from part of neighboring Jefferson County, and has retained its original boundaries ever since. The county takes its name from John Sevier, governor of the failed State of Franklin and first governor of Tennessee, who played a prominent role during the early years of settlement in the region. Since its establishment in 1795, the county seat has been situated at Sevierville (also named for Sevier), the eighth-oldest city in Tennessee. Sevier County was strongly pro-Union during the Civil War. When Tennessee held a vote on the state's Ordinance of Secession on June 8, 1861, Sevier Countians voted 1,528 to 60 in favor of remaining in the Union. In November 1861, William C. Pickens, Sheriff of Sevier County, led a failed attempt to destroy the railroad bridge at Strawberry Plains as part of the East Tennessee bridge-burning conspiracy. Prior to the late 1930s, Sevier County's population, economy, and society— which relied primarily on subsistence agriculture— held little significance vis-à-vis any other county in the rural South. However, with the creation of the Great Smoky Mountains National Park in the early 1930s, the future of Sevier County (within which lies thirty percent of the total area of the national park) changed drastically. Today, tourism supports the county's economy.